"I wanted to wait a few weeks before posting this story, because I wasn’t sure something horrible wasn’t going to happen as a result of it. 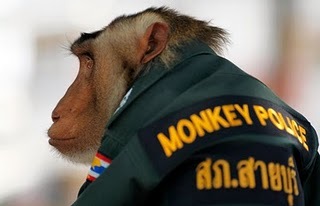 It seems that a province in southern Thailand has brought a pig-tailed macaque monkey on to its police force. And while I’ve seen some photos showing Officer Santisuk here getting a little yell-y and mooning the general populace, in general it seems that he hasn’t gotten drunk with power. Nobody’s face has been bitten off yet, which is more than some police forces here in the States can attest to. Keep it up, Santisuk, and maybe someday you’ll make detective.